Quick question – how do you remove an app on your Mac? If your answer is to drag the app to the Trash, we’re sorry to say that you’ve been doing it wrong. You probably know or guess that you can remove apps by dragging them to the Trash bin, but it is not quite so. Dragging normal files like documents and movies to the Trash works fine. But doing the same for apps leaves gigabytes of leftover junk files on your hard drive. We’re going to show you what gets left behind and what you can do to completely uninstall apps from here on out. 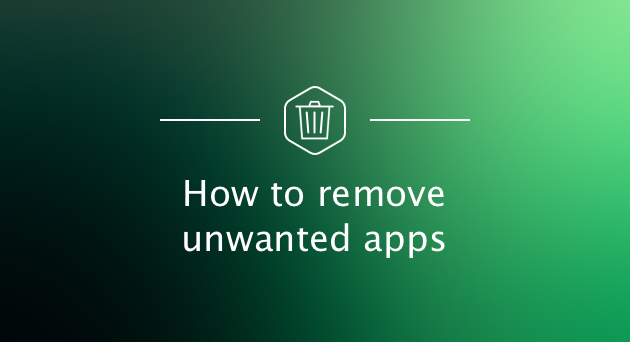 Removing apps is more than just moving them to the Trash — it’s completely uninstalling them. If you are trying to delete an old application, reinstall a corrupted software or just free up disk space on your Mac, removing all components of the program is important. These include the app, its preferences and support files, and sometimes other hidden files. Using CleanMyMac X (the easy way). We’re going to show you how to manually uninstall a program on Mac and then we’ll also show you the easy way. The easy way to remove apps involves a Mac uninstaller app, which will remove any app you want while also cleaning up the associated files spread across your hard drive and system. 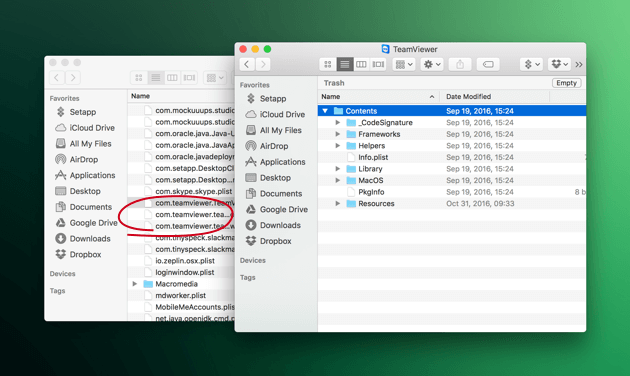 How to force delete an app on a Mac? That’s another problem that a quality uninstaller can solve. We’ll show you how to use the Uninstaller module in CleanMyMac X. It’s the safest option because it guarantees that the right files are deleted every time, so you never have a problem down the line. As a bonus, we’ll also show you how to uninstall the apps that you’ve forgotten are even there. Things like Java, Flash, and other extensions that are hard to find. Are you ready to uninstall Mac apps for good and clean up your system? Whether you're running macOS Mojave or an earlier OS X, like El Capitan or Yosemite, the process of manually uninstalling remains relatively similar. 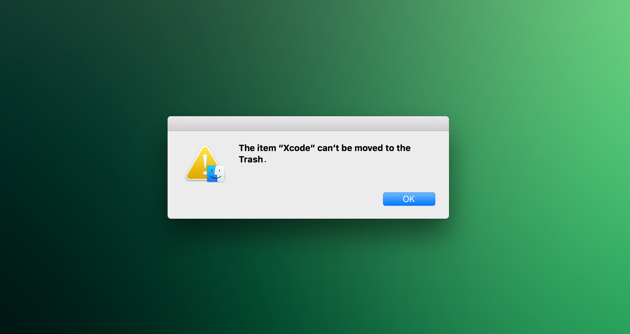 Even uninstalling apps on macOS Mojave requires getting rid of leftovers, despite the fact that it's the latest and the most sophisticated system for Mac. Apple has done such a good job on macOS 10.14 but left this unfortunate issue unresolved for another year. To completely remove programs from Mac manually, you have to find all the associated files that come along with the app. That means not just dragging the app icon to the Trash from your Applications folder, but searching the depths of the system files in your Mac. We’re going to reveal the locations of the most common files that are associated with apps. 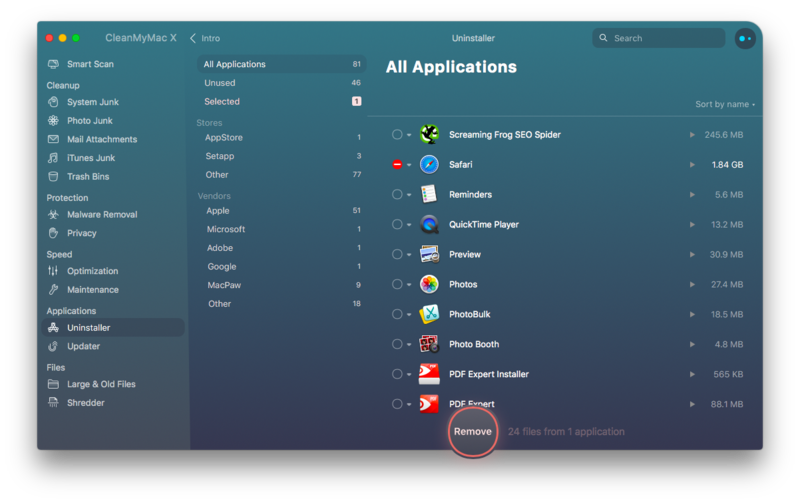 To remove the app leftovers from your Mac just navigate to each of these folders and hunt for the app you want to remove. If you find files with the app name you can send them to the Trash. There are many more hidden files, some of which cannot be accessed by the user. And macOS/OS X will prevent you from deleting some app files. As you can see, it's not that easy to remove apps from Mac manually, even when you know what to do. By the way, be sure to look for the name of the app in the file names of the files you remove. Don’t remove anything you don’t know! Do your due diligence before removing something from your system. When you delete software on Mac manually, be sure only to remove an app file or folder when you’re sure of what it is. Look at the name very carefully before you nuke it. Removing the wrong files could cause problems with your system. Remember, please be careful when deleting system files — you never know how it will affect your Mac if you remove the wrong ones (or the right ones for that matter!). Click Launchpad icon in your Mac's Dock. Click and hold the app until it starts shaking. Click X in the top-left corner of the app icon. This will uninstall the app from your Mac. However, keep in mind that after the removing the program, you should also delete its leftovers like we've described above. Can't uninstall an app on Mac? Unfortunately manual methods won’t get everything. Some apps are pre-installed macOS components and protected by the system while others will refuse to delete because they are already open (even though that’s often not true). So, how to delete the apps on Mac that won't delete? You can try the manual removal after force quitting the app in question (press Command-Option-Esc and if the app is on the list shut it down) or rebooting your Mac. If you're still unable to delete apps on Mac or if you’re worried you won't do it correctly and want a safer alternative, there’s the easy method of uninstalling apps from your Mac so you don't have to force delete applications. It actually does a better (and safer) job and in a fraction of the time. Read on to learn how. Now it’s time for the safe and quick app uninstalling option. There’s a safest way to uninstall software on Mac without searching all over your Mac, and that’s by using CleanMyMac X. It knows what to clean and what to leave be. CleanMyMac X’s Uninstaller module scans your entire system and compiles all installed applications and the files associated with them. Plus, it can also identify broken and outdated apps to help keep your Mac up to date. As if that wasn’t enough it will also remove all the little leftovers that Trash’ing an app misses. Launch CleanMyMac X and click on Uninstaller in the left menu. Select the app you want to remove from the list in the center. Once you’ve selected an application, you can either uninstall it or, if it’s not acting as it should, you can perform an Application Reset. Click on Uninstall or choose Application Reset at the top. Now that the application cleanup is complete, you can view a log of the removed items, or go back to your app list to uninstall more. As you can see, CleanMyMac X is intuitive and beautifully designed. It finds all the little parts and pieces you’re likely to leave behind on your Mac if you delete the app normally. Plus, CleanMyMac X is Mojave-compatible, so if you were looking for a macOS uninstaller, there you have it. With CleanMyMac you get a cleaner, faster, leftover-free Mac. Want to try it before buy? Download CleanMyMac X for free here. The trial version scans your Mac entirely, but only allows you to clean up to 500 MB of unnecessary files on your Mac. So you now know how to get rid of apps the manual way and the easy way. But what about hidden apps and extensions that can be hard to find, let alone remove. Well, we’ve got you covered. Below we have easy to follow methods for removing Java, Flash, and other stubborn processes and extensions. Once upon a time, Java was an important component. But now it’s just unnecessary and a security risk that’s not worth taking. Apple agrees, which is why it stopped supporting Java in macOS. If you have Java on your system and want it removed, once again there’s a hands-on manual way and an automatic easy way. The easier way to remove Java and other plugins would be to use CleanMyMac X's Extensions utility. It’s a free option in the trial version of the app so you can get rid of Java and manage all of your plugins, widgets, and extensions in a matter of seconds. 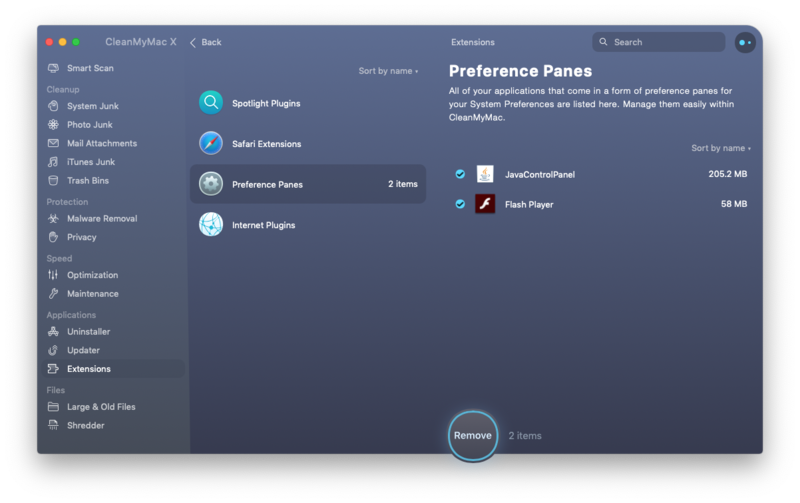 Open CleanMyMac and go to Extensions > Preferences Panes. Choose Java and everything related to it. Check it and hit Remove. Congrats, you completely removed Java off your Mac! Adobe Flash Player is an extension that, like Java, has become infamous for security and privacy problems. Steve Jobs even called the extension “buggy,” and blamed it for a range of issues. To remove Flash manually you can download the uninstaller from Adobe, but the process of finding the right version and the steps needed to do a proper removal of Flash is tiresome. Head over to get the full set of Adobe's Flash removal instructions. Alternatively, you could just use CleanMyMac to remove Flash in a few quick steps. Click on Extensions > Preference Panes. Select Flash Player from the list. Click Remove at the bottom. Browser extensions can offer significant benefits but they are often the first culprit when your browser starts misbehaving. If you have a problem extension or you just want to remove it to free up Mac resources, you can do so directly from your browser. Once you find the right section it’s easy to disable or remove whatever extension you want. Of course you can do the same with CleanMyMac, where all your browser extensions are clearly grouped into one clear section. As we already noted, CleanMyMac is free to download and try. It’s a handy and efficient way to deal with unwanted apps on your Mac if you don’t feel like spending hours on manual uninstallation. 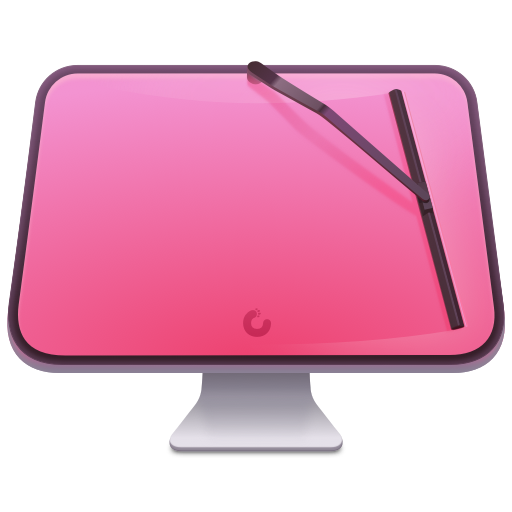 If you’ve cleaned up the system with CleanMyMac X and have decided not to use the application further, you can easily uninstall CleanMyMac from your Mac. And we’ll show you the right way to do it. Probably you guess that you can remove CleanMyMac by simply dragging it to the Trash. However, by doing this, it will leave its parts and leftovers on your Mac (as it happens when removing any other software). Therefore, the easiest way to completely uninstall CleanMyMac is by using CleanMyMac on itself. Proceed to the Uninstaller module. Find CleanMyMac in the list of found apps. Click Complete Removal in the Smart Selector panel to tick the application file and its related items for removal. Confirm the removal in the following dialogue window. That’s it! After doing this, CleanMyMac X will be safely uninstalled from your Mac. Whether you used the manual methods or let CleanMyMac do the job for you, the important thing is that your unwanted apps are now completely removed. Your Mac thanks you for it. Enjoy your extra storage space. Enjoy your new efficient Mac. Enjoy the feeling of blasting apps into dust with a couple of clicks! What are Mac System Preferences, and How Do I Fix Them?